The Type F plugs have two round, parallel prongs and it's also equip with 2 recesses one on the top, and one on the bottom that are used to receive the 2 metal plates located on the Type F power outlet for grounding. This style of grounding it's know as “Schuko” style. The Type F plugs are found in some European countries such as Germany and Austria. Type F plugs have 2 round, parallel pins and 2 openingd on the top and bottom designed for grounding contact with the power receptacle type F.
The grounding for type F plugs it's commonly know as Shuko style. 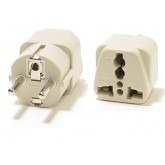 Most type F plug adapters contain grounding receptacle for Type E and F outlets as noted below, for more versatility when travelling through multiple countries. Type F plugs and adapters may also be used in type C outlets with no eath grounding. Rated for 16A 220-250 Volts 50/60HZ can be used on Computers and other items that contain detacheable power cords. Note : Power cords are an alternative for plug adapters, and do not convert electricity. Type F Shucko wall outlets are also very similar to their type E counterparts, with 2 round 4.8mm receptacles but with a different grounding system that entails 2 metal inserts located on the top and bottom of the recessed outlet receptacle.Type F outlets also contain 2 slits on each side of the receptacle, to grip the power plug that it's shaped to fit those inserts tightly, making virtually impossible to have a loose fit. The power outlets displayed above are designed to fit more than one plug style, which means that without the metal inserts, connection to these outlets with type F plugs would be non-grounded.Type F outlets are suited for type F and C plugs.